Seattle Seahawks quarterback Russell Wilson (3) passes against the San Francisco 49ers during the second quarter at CenturyLink Field. SEATTLE (AP) - Russell Wilson threw three first-half touchdowns on just four completions and finished with four TD passes. Bobby Wagner capped a blowout with a 98-yard interception return touchdown, and the Seattle Seahawks won their third straight by beating the San Francisco 49ers 43-16 on Sunday. Most of the attention centered on Richard Sherman's first game back in Seattle after spending his first seven seasons with the Seahawks before being released and signing with the 49ers (2-10) last March. He greeted former teammates during pregame warmups - even giving a brief handshake and hug to Wilson - and then had a mostly uneventful return. Early in the third quarter Wilson hit Baldwin on a short route and Sherman's close friend shook off the tackle attempt and raced 21 yards for a first down. Wilson finished 11 of 17 for 185 yards and has thrown at least two touchdowns in eight straight games. 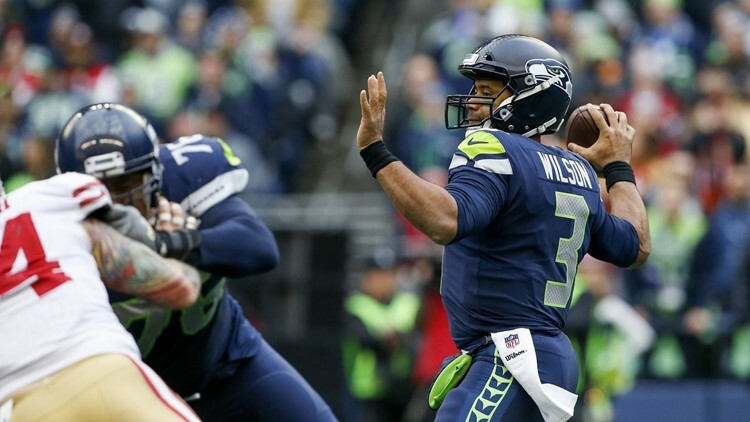 It was the eighth time in the regular season Wilson has thrown four or more TD passes. His last TD came on an 18-yard strike to Brown early in the fourth quarter after he broke free from Sherman's coverage. Wagner stole a fumble from Jeff Wilson Jr. at the Seattle 5 in the first half, one of two key fumbles by San Francisco. He then stepped in front of Nick Mullens' pass near the goal line and outran the rest of the 49ers for the longest interception return in team history. Seattle may have suffered a significant loss when guard D.J. Fluker had to be helped to the sideline early in the fourth quarter with a hamstring injury. Fluker has been a key part of Seattle's run-game resurgence and appeared very angry on the field about the injury. He did not return and left the field on a cart.